An orchestral and emotional concept album sang completely in Portuguese that will take you to the year of the horror when a giant earthquake destroyed the city of Lisbon. The year of 1755 marks the year of the horror when a giant earthquake destroyed the city of Lisbon, when almost 100 thousand souls lost their lives, and this tragic event is still considered one of the most disastrous catastrophes in European history and nature. 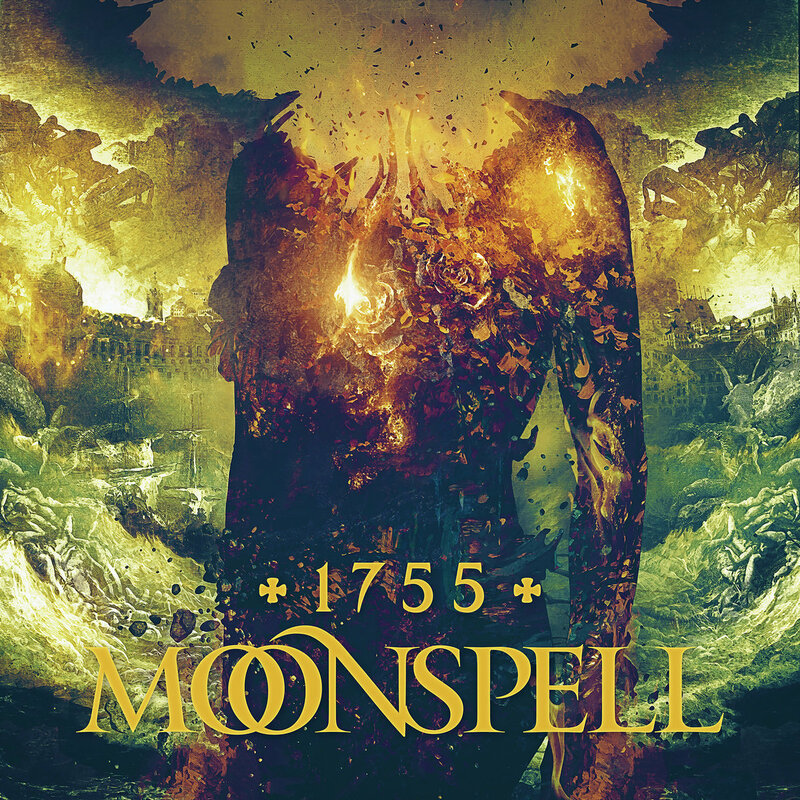 Now in 2017, in remembrance of the victims and the band’s hometown, the 1755 Lisbon earthquake was turned into a vicious, rip-roaring concept album straightforwardly titled 1755, the twelfth full-length studio release by Portuguese Dark Metal masters Moonspell, an orchestral and emotional adventure sang completely in Portuguese (which gives the whole album an additional poetic touch) that will transport your mind and soul to November 1, 1755, the holy day of All Saints’ Day and the day that the earth shook like never before in Lisbon. There are a few remarkable differences between 1755 and Moonspell’s latest releases such as Night Eternal, Alpha Noir/Omega White and especially Extinct, as the band “distanced” themselves a little from the more Gothic and melodic approach from the past decade to venture through the realms of symphonic and epic sounds, and the final result couldn’t be more breathtaking. 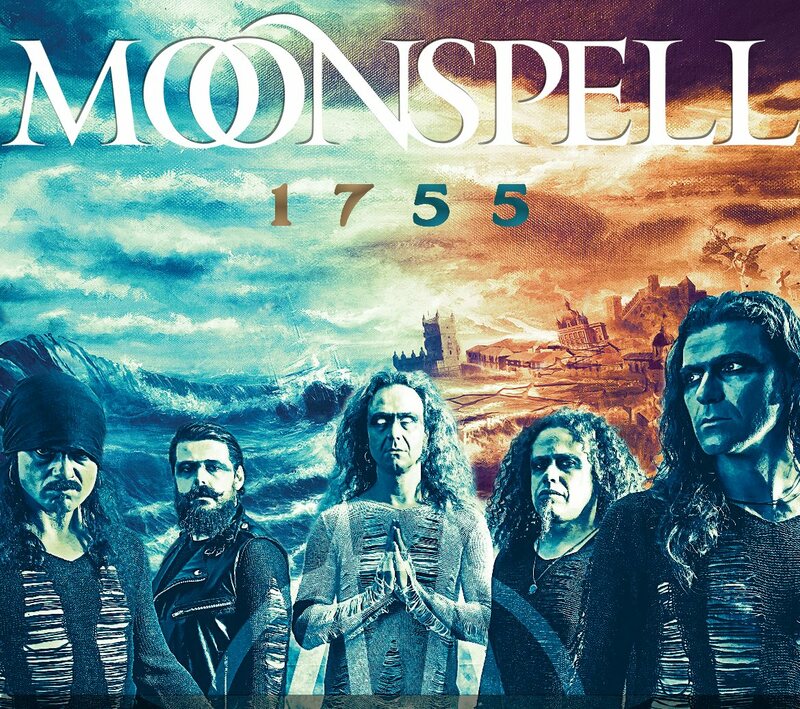 Featuring a lavish artwork by Portuguese artist João Diogo (Dramafall), 1755 might not be an easy listen at first for newcomers to the world of Moonspell or even to longtime fans of the band who don’t know a single word in Portuguese, but the final result is so compelling, sharp and cohesive I’m sure the whole album will grow on you until it becomes a mandatory part of your day-to-day playlist. When I first saw the tracklist for 1755 I asked myself why they added one of their old songs as the opening track of the album, but after hitting play everything made sense. Em Nome Do Medo (or “in the name of fear”) is an obscure, haunting and absolutely awesome orchestral version for their biggest classic sung in Portuguese, from their 2012 album Alpha Noir/Omega White (take a listen at the original version HERE), with highlights to the superb job done by guest musician Jon Phipps (who actually created the orchestrations for the whole album) and the insanely beautiful choir (comprised of the amazing Crystal Mountain Singers and Tristania’s own Mariangela Dermutas) that accompanies frontman Fernando Ribeiro and his piercing vocals, and that epic aura of darkness goes on in the title-track 1755, where keyboardist Pedro Paixão delivers as usual some insane keys that complement the guitar sounds flawlessly. And what to say about Ricardo Amorim’s souful guitar solo? Put differently, I simply can’t wait to witness Moonspell playing this metallic opera live. And leaning towards a more metallic, rockin’ vein we have the threatening In Tremor Dei (or “fear Of God”), presenting the band’s characteristic Dark Metal with Fernando being beautifully supported by guest vocalist Paulo Bragança (who supplies the trenchant voice of a Fado fallen angel who is a big part of the Portuguese culture), with the song’s lyrics perfectly depicting the fire, wreckage, despair and death that took over Lisbon that day. Desastre (the Portuguese word for “disaster”) gets closer to what the band did in Night Eternal, with Fernando’s growls sounding deeper and more enraged as he screams the word “culpado” (or “guilty” in English) with all his fury. Furthermore, the beats by drummer Miguel Gaspar will hit you hard inside your mind, showing how acute the entire album is. Then orchestral elements shine in another great display of Dark Metal blended with classical music titled Abanão (which means “quake” or “shakeup”), where Pedro once again boosts the song’s epicness with his keyboards while Miguel and bassist Aires Pereira live up to the song’s name with their rumbling beats and bass punches, respectively; followed by Evento (or “event”), where Moonspell keep blending their own sonority from Night Eternal with Memorial and more intense elements from orchestral music, not to mention how its lyrics showcase the thin line between love and hate people experience with religion. It’s another one of the top moments of the album, and needless to say it should also sound fantastic if played live. And 1 De Novembro (or “1st of November”), in reference to the day the earthquake happened, brings forward a more contemporary version of Moonspell where Fernando’s voice sounds considerably different than usual and where tons of heaviness and epicness arise due to the excellent job done by Pedro and Miguel on keys and drums. Then infused with modern Gothic and Dark Metal similar to what they did in the darkest and most melancholic tracks of Alpha Noir/Omega White, but with an epic twist, Ruínas (or “ruins”) displays an 80’s-inspired rhythm where the bass lines by Aires sound ominous, with its lyrics passionately declaimed by Fernando transmitting a true sense of hopelessness, setting the tone for Todos Os Santos (or “all saints”), one of the strongest tracks of the album and the musical depiction of the eternal war between men and God. Its thrilling guitars combined with the powerful vocals by Fernando and its thunderous backing vocals result in top-notch Moonspell music, also presenting a catchy-as-hell chorus (even if you don’t know anything in Potuguese) in a beyond perfect closing to such sad and important event in the history of Portugal. As a matter of fact, there’s still one more song in the regular version of the album, their cover version for Brazilian rock band Os Paralamas do Sucesso’s hit Lanterna Dos Afogados (listen to the original song HERE), feeling more like a “bonus” than a regular track and sounding very somber, melancholic and touching, with Fernando giving a lesson in dark vocals. Moreover, if you go with any of the special editions of 1755, you’ll also be treated to the Spanish version of Desastre, which according to Moonspell themselves is a homage to all their Spanish-speaking fans around the world, as in the late 18th century a mixture of Spanish and Portuguese was spoken in the streets of Lisbon. What Moonspell did in 1755, turning all devastation, death and grief from the 1755 Lisbon earthquake into first-class art, is not only terrific musically speaking, but it also proves that the human being is capable of finding beauty even in the most adverse moments, and I guess that’s some sort of subliminal message the band wanted to send us all with this excellent album. With that said, go grab your favorite version of 1755 at the Napalm Records webshop, or at the band’s own BandCamp page or official European webstore, and learn more about one of the saddest and most terrifying day in the history of Portugal. 1755 might be known as the year of the horror, as the year when God abandoned the people of Lisbon, but at least we have Moonspell to properly tell that grim story to us all and to soothe our hearts and souls forevermore with their undisputed Dark Metal. Best moments of the album: 1755, In Tremor Dei, Evento and Todos Os Santos.